PocketBook is the first company in the world to implement capacitive multi-sensor Film Touch screens at its device – PocketBook Basic Touch! Film Touch technology uses touch film of only 0,2 mm thin which is equal to two sheets of paper. A wireless built-in Wi-Fi module opens limitless opportunities for staying connected and sharing your reading experience with your friends and family over social networks with the new ReadRate service.The new slim and stylish PocketBook Basic Touch offers you an outstanding sense of comfort and pleasure. 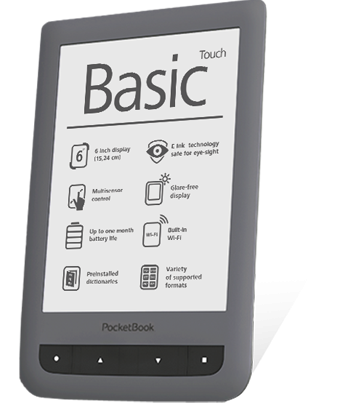 PocketBook Basic Touch is equipped with a 6 inch E Ink Pearl display. Together with Film Touch layer which is applied over the main screen PocketBook Basic Touch offers minimal thickness and better optical characteristics which is important to achieve a more paper-like reading experience! 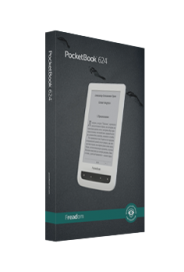 The new PocketBook Basic Touch promises smoother page turning and higher performance to make the best out of your reading experience with its new powerful CPU and extended Mobile SDRAM. PocketBook Basic Touch has 8 GB of internal memory as well as a Micro SD card slot (up to 32 GB.). PocketBook Basic Touch also introduces Dropbox integration, a service which allows you to easily update your eReader’s library by automatically synchronizing the files available on your Dropbox account, no wires or software needed. PocketBook Basic Touch uses a modern user interface and multi-sensor touch controls as well as hardware paging buttons to make sure it gives everything you need for a comfortable reading experience.